Tuesday, the restaurant chain Legal Sea Foods will roll out three 15-second commercials that initially look like heart-tugging environmental public-service spots about "saving" salmon, trout and crabs — but pull a sudden switcheroo to suddenly become ads prodding folks to chow down on its seafood. The campaign comes just months after deal-of-the-day website Groupon aired — then yanked — a similar campaign that included actor Cuba Gooding Jr. initially lamenting the dwindling whale population before admitting that instead of "saving" the whales he'd much rather observe them jump out of the water while on a half-price Groupon whale-watching cruise. A Tea Party-infused nation — with Texas Gov. Rick Perry now a top Republican presidential candidate — seems ever-ready to embrace such seemingly anti-liberal marketing imagery. "I'm not trying to antagonize environmentalists," says Roger Berkowitz, CEO of Legal Sea Foods. "I'm trying to educate consumers." 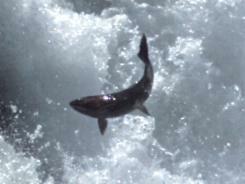 In one spot, a lone trout is shown swimming in a stream. "Save the trout," says an off-screen narrator. "Save it to swim another day through golden brooks and sunlit streams." Then, the narrator suddenly changes his tune: "Or just save it so we can grill that baby up real nice." The folks at Greenpeace aren't amused by the Legal Sea Foods ads at all. "Ironically, the trout sold by Legal Sea Foods is farmed and has never seen a golden brook or sunlit stream," says John Hocevar, director of Greenpeace Oceans. "The choice isn't between putting fish on a pedestal or eating them, it's between reforming the way we produce our seafood or irrevocably degrading our oceans." And the Natural Resources Defense Council, while unfamiliar with Legal Sea Foods' specific sustainability practices, is somewhat dubious about the ad's intent. "With sustainable fishing practices, we can have our fish and eat it, too," says Jennifer Powers, national media director. But Berkowitz says the ads will be a viral hit with young folks. "The ads play to the next generation," he says. "They might have grown up watching South Park instead of Disney's Wonderful World of Color." Branding guru Jason Mudd says the ads hit home. "Diners want an experience," he says. "These ads show that Legal Sea Foods has an edge — and attitude."